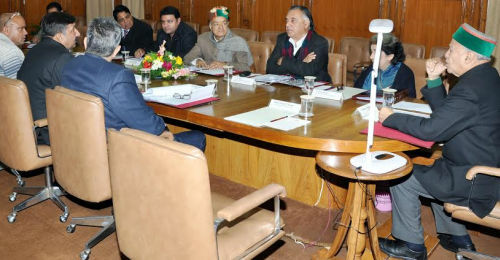 Himachal Pradesh Cabinet granted approval to revised minimum wages to the labourers working in private sector under Minimum Wages Act, 1948 from Rs. 110 to Rs. 120 and bring them at par with the laborers working in Government Sector. It approved enhancement in the Honorarium of the Freedom Fighters in the State from Rs. 4,000 to Rs. 5,000 per month. In the press release of the government here it says that the cabinet has decided to formulate a Scheme to honour the officers and officials of different departments engaged in construction activities of various projects for achieving the completion target of the projects ahead of their scheduled time and for saving on estimated cost as well so that good workers are encouraged and time and money also saved. It has been decided to decentralize the power conferred by section 8-A of the Himachal Pradesh Village Common Lands Vesting and Utilization Act, 1974 and authorize all the District Collectors/Deputy Commissioners to change pool of land vested in the State Government under the provisions of the said Act, strictly in accordance with the provisions of Section 8-A read with section 8 of the Act, ibid, in their respective jurisdiction so as to minimize the time taken in transfer of such lands. Increasing the minimum wages is a good step towards the upliftment of the daily wagers but still 120 is not good enough to feed the family who are totally dependent on single earning person in the family. In the upper region of the Shimla district, daily wagers are getting Rs. 150 for the day with lunch.